A segment of my ascending colon and a portion of my ileum we're used to create a substitute bladder (Indiana Pouch). As a result, I must take certain supplements (B12, D3) subligually to overcome the resulting absorption issue associated with the loss of a part of my small intestines. I have Ulcerative Colitis in "remission" from the immune suppressant 6-Mercaptopurine. I have been taking pHi-Zymes for about 45 days. I feel phenomenal—the best in 30 years. I just got a C-Reactive Protein result of 0.4! Only half of my best ever. I think your systemic enzymes are the reason. One question, is there any reason pHi-Zymes would be a conflict with the immune suppressant? I can't think of any. You have options! However, the Foundation does not sell any products. We are purely a non-profit, online health information service only. All of Jon Barron's formulas are sold by http://www.baselinenutritionals.com. Any customer or product related questions need to be directed to: [email protected]. The Foundation does not sell any products. We are purely a non-profit, online health information service only. All of Jon Barron's formulas are sold by http://www.baselinenutritionals.com. Any customer or product related questions need to be directed to: [email protected]. 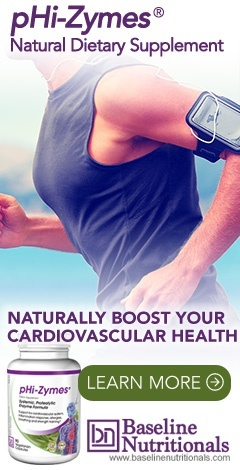 I am in dire need of using the pHi-Zymes supplement to assist my circulatory system due to PAD...especially in my feet. I also have scar tissue I need removed. My concern is the umbilical hernia mesh I have in place. I've been searching high and low for this answer, but haven't had any success. Jon's expertise in this area is much needed. Will the enzymes adversely affect the mesh and cause problems down the road if I use them? I know there has to be scar tissue involved with the mesh.If the enzymes were to cause problems in this area due to the mesh, is there an alternative to removing plaque from the blood vessels in my feet that can aid in the removal of plaque build up in my circulatory system? Would another option be Nattokinase used by itself, or possibly another option? I hope you can help me with this, so I can get started as soon as possible. Thank you in advance. Going to give it a try. Had planned on getting enzymes that had Serrapeptase for it's ability to eliminate Fibrin which I believe is one of the major health culprits, but you seemed to have that covered. I enjoyed reading your article. I've have had RA for 19 years. I am 62. My problem is that I am extremely sensitive to a lot of foods, and more specifically, to seasonings or herbs. If I eat a prepared food, the seasonings that it was prepared with will cause me joint pain, specifically in my hands/arms. Everything seems to bother me: cayenne, turmeric, cumin, oregano, arugula, red pepper, etc. The only few things I can prepare my food with is garlic powder, onion powder, salt, and black pepper. That's it! And it's not a good idea for me to use salt at all because I swell very easily. I have no doubt that I have leaky gut. I've been taking meds like prednisone, plaquenil, arava, Enbrel, etc for 19 years, however, I'm off of prednisone and plaquenil now as of last February, but that's still a long time having to take it. I was wondering if you have any suggestions or have you heard of anyone with really bad sensitivities to the point where they are extremely limited in what they eat? And what's making me miserable is that I'm ALWAYS HUNGRY! To have a limited diet and always hungry, always craving salty/sweet foods is making me miserable. Thankfully, I don't have and have never had a weight problem (5'4", 110 lbs). BTW, I turned vegan about six years ago, however, I've been going back and forth a little, sometimes eating a little chicken or beef. But I will don't have any intentions of going back to dairy or pork at all.